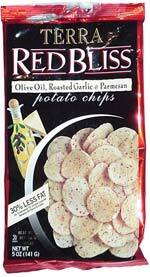 They're thick and crunchy like most Terra potato chips, and they've got an amazing pamesan flavor. Really tasty. Smell test: There's a nice parmesan smell to these. This snack was discovered by Keith and Melissa at Trader Joe's.